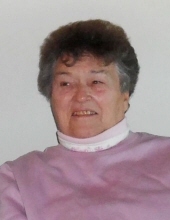 Barbara Ruth McKinlay, 80, passed away March 30, 2019 at the skilled nursing center in Lewistown, MT; four days before her 81st birthday. She was born April 4, 1938 to John Doyle Euell and Sylvia Euell in Jordan, MT. She attended school in Jordan until her family moved to Fairfield. When she was 16 she met the love of her life, Harold McKinlay. They were married on July 31, 1955 and spent every second together until he died on February 22, 2019. Thirty-seven heart breaking days later she joined him in heaven. She never wanted him to go anywhere without her and now they are peacefully together again. They were married in Carter, MT and a short time later moved to the Green Ranch at Buffalo. Within a year, Harold, Barbara, and two year old Sherri, moved to Harold's aunt and uncle's ranch (Ester and Charles Shrewsbury). Roberta and Judy came along shortly thereafter. Harold and Barbara purchased the ranch in 1969, where they raised their children and spent every day together until Harold's passing. Barbara is survived by her children, Sherri (James) Bergstrom of Buffalo, MT, and Judy (Les) Swanson of Buffalo, MT; grandchildren, Heather (Chad) Finneman of Havre, Tracy Bergstrom of Choteau, Dan (Jolene) Bergstrom of Billings, Roger (Toni) Bergstrom of Joliet, Cody (Crystal) Swanson of Buffalo, Amanda (Bryce) Hove of Circle, Robert (Katrina) Bergstrom of Toronto, Canada, and Barbara (Andy) Guy of Buffalo; 16 great-grandchildren; brother, Doyle (Yvonne) Euell of Glasgow, MT; and sister, Pattie Johnson of Great Falls, MT. Barbara is preceded in death by her parents, John Doyle Euell and Sylvia Euell; sister, Dessie Cadd; husband, Harold McKinlay; and her daughter, Roberta Larson. A Memorial Service will be held at the Utica Hall on Saturday, April 6, 2019 at 3:00 p.m. A private inurnment will be held later on the family ranch at the foot of the Twin Sisters Mountain. Memorial donations in Barbara’s honor can be made to a charity of your choice. To send flowers or a remembrance gift to the family of Barbara Ruth McKinlay, please visit our Tribute Store. Corner of Pig Eye Rd and South Fork Rd. "Email Address" would like to share the life celebration of Barbara Ruth McKinlay. Click on the "link" to go to share a favorite memory or leave a condolence message for the family.